Doesn’t seem like much…remember, my garden is only 4′ x 8′! I plan on freezing the peppers so that I can use them to make a “garden salsa” once more of the tomatoes ripen. Details on freezing peppers at PickYourOwn.org! Tonight we had leftover Pork Chops and Macaroni Salad from the birthday party. Hoping to come up with a delicious pasta using some of the harvest for tomorrow night! I am so proud of you and all that hard work! I so remember last season that joy of first harvest. I can’t wait to have a garden, looks great!! hey erin! what a great harvest! i would love to see more posts on how you got your garden together and how you care for it (fertilize,etc). Yep…planning on one of those this weekend! They look fantastic! Cant wait to hear about the pasta! You are doing really well! I am new to gardening and boy oh boy am I having trouble I do have roma tomatoes but it is hit and miss they have bottom end rot sometimes ( in az they say it from fluctuations in watering/drying out and then too much water-this is hard to control when you hit 113 one day and 99 the next) and my cantaloupe and cucumbers are spreading like crazy but no fruit! EEEK I think I better start composting for better soil or something. 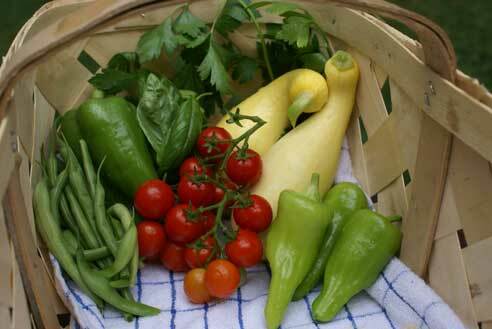 I get a new wave of determination when I see what you are pulling out of your garden! Are you blanching the peppers first since you’re freezing them for salsa? I’m so curious- I have tons of peppers now but my tomatoes aren’t ready yet!!! I saw that both directions are there- but since you’re doing salsa- I was wondering which you are doing!!! I’m hoping to can some salsa for christmas gifts!!! I love that pick your own site…gotten tons of good info there!!! Just gonna freeze them as is! I’d prefer to have them “un-blanched” when I go to make the salsa! I think it looks like a lot of veggies! Well done! if you’re interested. Really enjoy your site!